Bathroom renovations can be difficult for novices to plan and implement because there are so many systems and materials packed into what is usually a small room. Bathrooms also play host to a home’s most inhospitable conditions (heat and humidity), so it is important that all the finishes are installed correctly. Otherwise, you will be renovating your bathroom again sooner than you think! 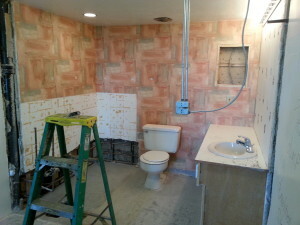 Most portions of a bathroom renovation should be handled by professionals. Water and electricity don’t play nice together, so make sure that the people who work on those components know what they are doing. Plumbing System – How are the supply lines routed to your bathroom? Avoid locating them on exterior walls if possible. If it is unavoidable, make sure they are extremely well-insulated. Are the pipes sized appropriately for your planned renovation? What new plumbing fixtures do you want, and what can be reused? Don’t be surprised if you need to tear into walls outside the bathroom or a finished ceiling below in order to access the plumbing. Plumbing Fixtures – Will you be salvaging/keeping any original fixtures? If so, what repairs do they need? Is the floor properly supported for any new fixtures (such as an oversized tub)? Will you be able to get new plumbing fixtures up the stairway and through any doors? Check out the Habitat for Humanity ReStore for some good deals on plumbing fixtures. Electrical – All outlets must be ground fault protected (GFCI). Run additional power to supply new loads such as electric radiant heat, towel warmer, or a point-of-use water heater. Think about adding an outlet low on a side wall for a night light. Light Fixtures and Design – Light fixtures may be required to be UL listed for wet/humidapplications. Consider a recessed light in the shower and task lighting over the sink as well as a general ceiling fixture. Insulation and Moisture Protection – Install insulation behind the tub. If you are gutting the bathroom, add as much wall insulation as you can. Install a moisture barrier on the inside of the insulation (unless it has an integral moisture barrier). Install the best vent fan you can afford and vent it directly to the outside. Finish Materials – Consider using durable materials such as tile, particularly in the shower and on floor. Make sure that all materials are rated for installation in a wet area, and all materials are installed correctly according to the manufacturer’s specifications. Consult a professional designer if you have questions. Storage – Bathrooms often have areas that can make perfect storage nooks – don’t waste space! Colors – Pick neutral colors for the major permanent elements such as the tile, cabinets, and fixtures. Add color and interest with elements that can be changed more easily such as paint, shower curtain, towels, etc. This way, if you get tired of the scheme, it can be changed with much less fuss and expense. You will also need to plan for down-time during construction. If this is your home’s only bathroom, be ready for it to be out of commission for a while. It is often possible to arrange to have the toilet available for use during almost the entire renovation process, but be prepared to do a lot of tooth brushing at the kitchen sink.